This quote from Abraham Joshua Heschel was included by Rashi student Danny Shleifer in his eighth-grade graduation speech last spring. 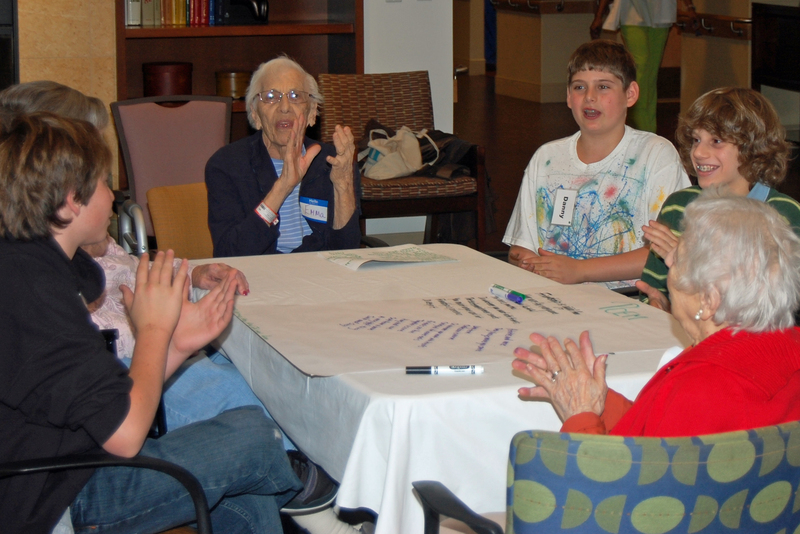 Danny and his classmates took part in a new program that brings together Rashi students and the senior residents of NewBridge on the Charles, the Hebrew SeniorLife community with which The Rashi School shares a campus. As the program’s coordinator, I have seen how the program has touched young and old alike and I have witnessed Heschel’s words come to life. I would like to share some stories. Over several months, they shared conversation, games and many hugs. In the spring, Mr. Goldberg died at the age of 98. As Rebecca cried with me and sought comfort for her grieving child, she celebrated the relationship and how it had made Jacob a better person. Rebecca has since joined the Rashi/NewBridge Multigenerational Committee that oversees the partnership. Jacob still visits Mrs. Goldberg and sees her when he comes to NewBridge for “Get Fit Stay Fit” – a shared fitness program for Rashi fifth and sixth graders and NewBridge residents. And when Jacob sleeps outdoors, he looks for Mr. Goldberg among the stars. Roz felt that the breakthrough came when she told Kayla that her son had had a learning disability that held him back, but he worked hard and eventually achieved great success as the president of their family business. Over time, trust grew between the two. They felt comfortable enough together that Roz could correct Kayla’s pronunciation and help her become a better reader. But more than words brought them together. I could see that every time they parted, it was with a hug. This year, Roz comes weekly to Rashi to support the learning needs of students in the Lower School. Finally, there’s my daughter’s story. Jackie, who graduated from Rashi in 2011, has had many wonderful opportunities to be with seniors. She regularly visits her grandparents, who are residents in the independent living community at NewBridge. She participated in the Rashi Middle School program that connects students with residents who struggle with Alzheimer’s and dementia. She helped to support my father throughout his battle with ALS, which robbed him of the ability to speak and walk, and which, last December, took his life. These experiences all transformed my once reticent girl. One Sunday afternoon last spring, my children and several other Rashi families volunteered to help out at a community building event at NewBridge. To my surprise, Jackie approached an elderly man who was sitting in a wheelchair. He was barely able to speak, but she sat down with him and chatted for more than 20 minutes. When she was finished, I asked her what they talked about all that time. “I don’t know, Mom,” she replied. “I couldn’t really understand him. But I just talked about myself and asked him questions. I think he liked that.” He did. When I spoke with him later that day and he learned that Jackie was my daughter, he told me that she had made his day.